With the unique ability to adapt to specific business applications, the Color imageRUNNER model leverages the full capabilities of Canon's Color imageCHIP system architecture and advanced customizable capabilities. 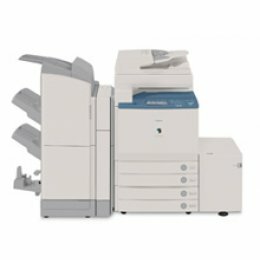 The Color imageRUNNER C4580 model operates at up to 45 pages per minute (letter) in monochrome and up to 40 ppm (letter) in brilliant color. The Color imageRUNNER C4580 model is highly customizable and offers options that best fit demanding color environments. The Color imageRUNNER C4580 model is powered by Canon's evolutionary imageCHIP system architecture. It not only enables simultaneous copying, printing, scanning, sending and faxing, it also delivers output at speeds of up to 45 pages per minute (letter) in monochrome and up to 40 ppm (letter) in brilliant color. With Canon's Twin-Belt Fusing Technology fast print speeds and warm up times are achieved. And at true 1200 dpi, every word will appear with absolute clarity with the highly precise four-beam laser scanner. The Color imageRUNNER model ships with standard automatic duplexing, and a paper capacity of 1,200 sheets that can be upgraded to support a maximum capacity of 5,000 sheets through six sources. The Color imageRUNNER model offers a choice of three finishers that provide extensive stacking capabilities, multi-position stapling, saddle-stitched booklet output, and optional hole punching for professional-looking output. Flexibility to accommodate all job types on one machine.